Have you heard of layflat books? In our opinion, this is one of the best looking solutions in book binding available and for sure one that provides the highest user experience. The lay flat binding method is an increasingly popular choice as a style of finishing. Layflat books open completely flat across the centre fold without the pages closing when placed down on a table. This solution means that photographs in particular can be run across both halves of the spread with no loss of visibility down the centre of the spine. This gives some exciting design options, including landscape formats that open to display panoramas. Moreover, as lay flat books are made using high quality photographic paper, the imagery within stands out beautifully, creating maximum impact. Lay flat binding is eminently suitable for corporate publications, coffee table books, art books, or product books – anywhere quality images and content are bound in books. Construction of lay flat books is simple, but comparatively time consuming compared to more conventional binding methods such as perfect binding or saddle-stitching. It starts with single-sided printed pages that are folded in half, then one blank side is glued to the opposing blank side of the next spread in the sequence, and so on until all the spreads are attached to form a block. 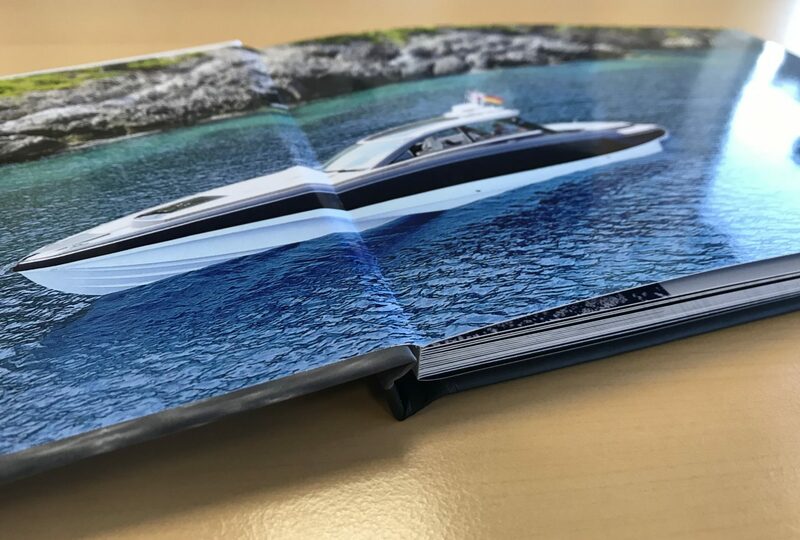 The example shown above was for a layflat book designed and printed by ourselves for our long-term client, Ice Marine. 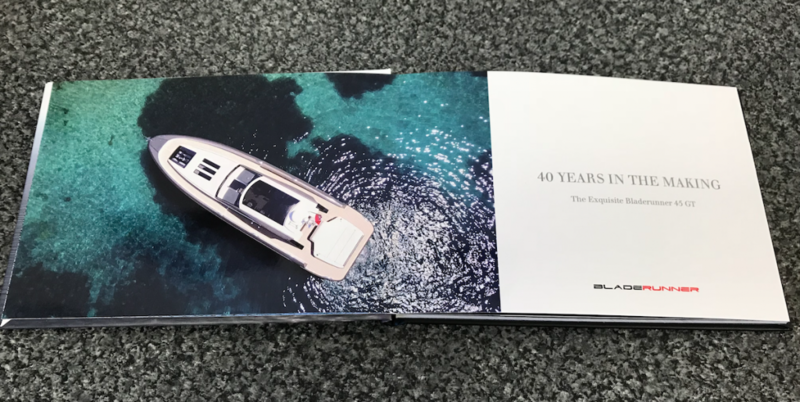 These were provided to them at the 2018 Monaco Yacht Show to celebrate 40 years of the iconic Bladerunner powerboat brand. To find out more regarding layflat books and how these will benefit your own maketing, contact our client Services Director, Frank Norman on 01784 410380 or by email.